Another Friday; another voting session! Kick off your weekend by visiting HighLowAha to cast your vote for your favorite game food; polls are open until 9pm EST. This week's secret ingredient was turkey. I am very happy to present to you a very versatile appetizer - something that is suitable for cooks of all levels. 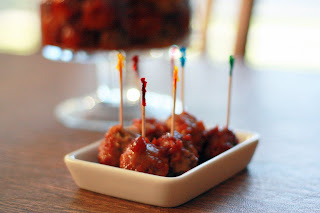 A few months ago, I stumbled upon The Pioneer Woman's BBQ Meatballs. I've made them repeatedly, and each time they are delicious. I've used them in sandwiches, on top of mashed potatoes, mixed with pasta, and on their own; no matter how I've prepared them, they were amazing. Now that the cold weather is absolutely upon us, this recipe is the first thing I thought up when trying to come up with a turkey snack. I frequently make this meal with ground turkey rather than beef in an effort to be a bit healthier, and I actually find them yummier as well. 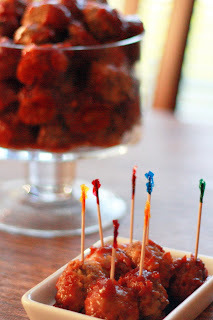 So for this week, I shrunk 'em down and adjusted the sauce to make these the perfect snack to grab while watching your team. Perhaps the best part about this is that, truly, anyone can make these. While they are time consuming, they are very basic and simple. Short on time? No problem! 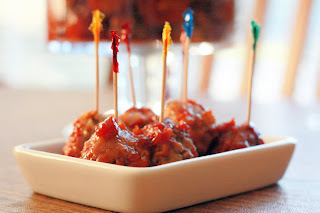 Grab a package of pre-made meatballs and just make the sauce. Easy peasy. My three-year-old LOVES these, and so will your guests. Enjoy! Remove from freezer and immediately dredge in unseasoned flour. These look really delicious, but I'm actually commenting to say that I made your Brie Stuffed Mushrooms for a Christmas party recently, and I loved them. They were great spin on the average stuffed mushroom, and I've never cooked with brie before, so I was pleasantly surprised. These look delicious - great idea!